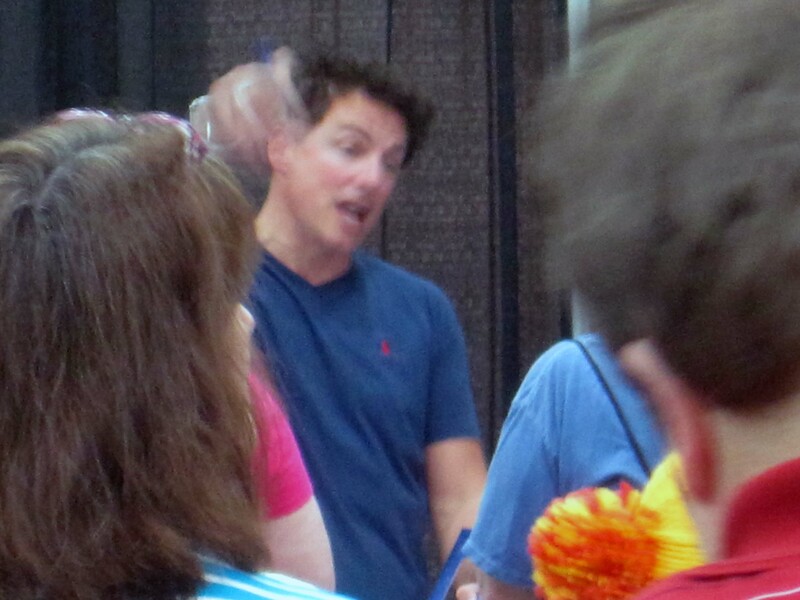 as well as the OMFG-he’s-better-looking-in-person John Barrowman. Farstuckerily, I mention that he and I exchanged words. None of the celebrities were at their tables, and then I saw him running toward me, and I said, aloud, “Oh, there’s one of them!” Surprisingly, I really don’t recall his reply, which was something noble like, “Yep, I’m here to stay!” because I was so stunned by the stupidity of my own utterance. 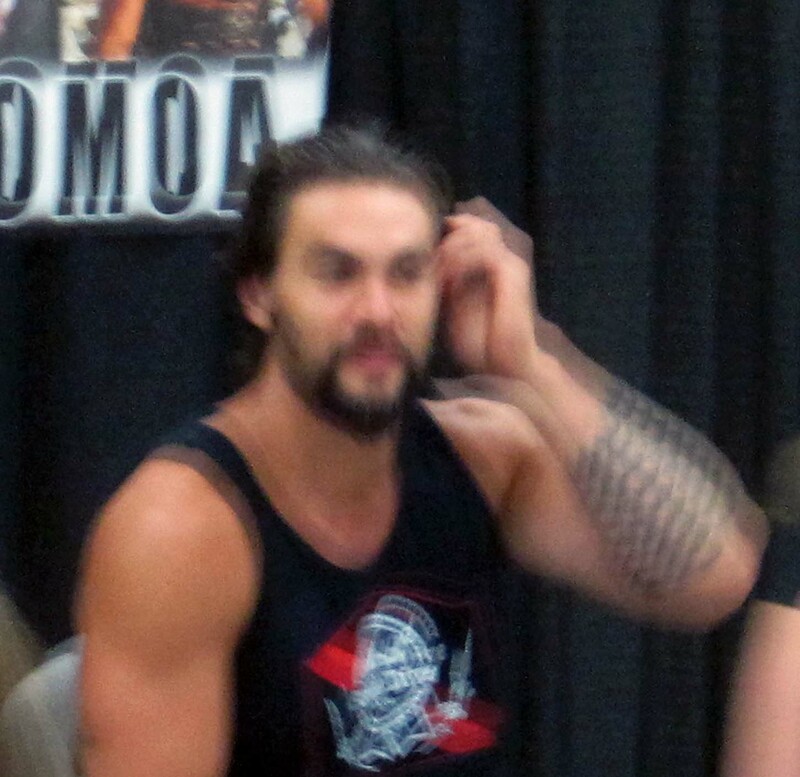 Luckily, “Oh, hi!” was all I said when I almost bumped into he-who-has-neither-aged-nor-lost-muscle-mass Jason Momoa (tattoo actual, other arm effects result of distance/focus/motion problems). I cannot claim any interesting interaction with William Shatner beyond being in the same room with him, but I guess I kind of touched his aura, if that matters in a farstuckery way, and I think, hey, there are baby pictures of me with images of this guy on the television in the background, and in high school I focused resume-like on going to enough conventions to see all the main Star Trek and especially Star Trek: The Next Generation cast I loved. I focused so well that, really, William Shatner was the ONLY person who was missing. And just think, I got even closer to him on the last day of the con! An official-looking woman scowled at me when I tried to take a picture, though, so the above, from the previous day, is the best I’ve got. Definitely on the just-had-it-out-with-Malcolm-McDowell side of Shatner facial expressions as opposed to, I dunno, how he felt when he saved the whales. That scowling woman got me thinking. I don’t know if she worked for Shatner or the convention, but either way, she might have noticed either of the badges I was wearing. One said “Guest,” which means that, while of course I was nowhere near the same level, I was in the same category as Mr. Shatner. While professional courtesy may be as dead as, say, chivalry, it doesn’t have to be. The more important badge for the point here said “Exhibitor.” The Exhibitors either paid a lot of money to be there or were there at the behest of someone who paid a lot of money to be there. Why? The usual: to sell stuff. But it’s kind of a special case. At least I think it is, because it’s why I was there. Most of us were there sell our work (without charging people hundreds for our autographs like the big celebs). We can’t be artists/craftspeople/whatever if we don’t believe in what we do enough to spread it a little like something between gospel and vacuum cleaners. I was there to help sell and get the word out about my novel Burning the Middle Ground. 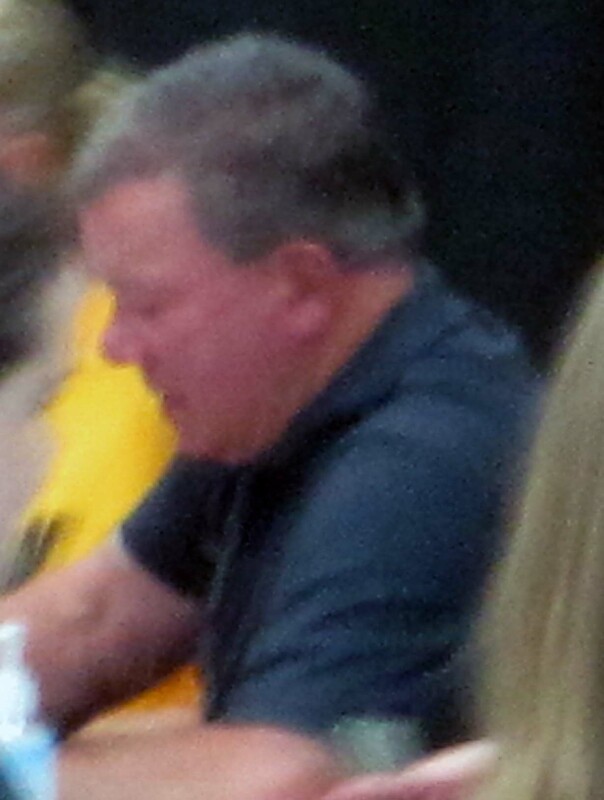 And really, William Shatner, bless him because he didn’t have to do it, was there to get people to walk by my table. That’s right, the people who paid for the conference–I was there at the behest of my publisher, who did the paying–as well as the fans themselves, are the clients, and Shatner and the rest of them, as well as the convention organizers, are the service providers. Service providers serve clients. The scowling woman, assuming she noticed my Exhibitor badge, failed to realize this simple fact. So when I think back on my experience at FandomFest, what’s coolest has nothing to do with the headliners and everything to do with the REAL stars of the show, the ones who were not already assured of adulation, the guests on panels with me and colleagues I was lucky enough to see. That’s right, folks, even though the people pictured above would be welcome to come around for a drink sometime, these writers I got to work with are better than Shatner and Anderson and Barrowman and Momoa combined (perhaps even multiplied a few times over, too).